Sessions for babies and toddlers are all about celebrating your little one's milestones, changing personality, and creating lifelong memories of their first few years. Baby photography sessions are designed to provide families with unique sessions throughout the year to create memories for the walls of their home, for baby books, and to share with family members and friends. As a mom of three, I know how hard it is to capture photos of your little ones: they're fast, you're busy, and it becomes one more thing on your growing to do list. You would love to have beautiful photographs of your little one while they are changing and growing so quickly but it can be so challenging to capture how adorable they really are on camera. With over 8 years of full-time experience and with hundreds of babies and young children having come into my studio I know how to photograph your little one at all ages and stages. I love creating beautiful photographs that highlight their unique features and show off their current milestones so that you can always remember them as they were when they were small and just learning about the world. I understand how busy life is when you have young children and how hard it can be to carve out time for a photo session when your baby’s first year seems to be flying by. Let me take the stress and hassle out of your photography session so that you can have an enjoyable experience while making memories with your child that will last a lifetime. My sessions for babies and toddlers are styled to create beautiful portraits of your child and of your family together that you will treasure forever. The studio offers a variety of studio sets, child size props, and classic accessories that are available to my baby and toddler clients to ensure they can create just the right “look” for their child’s session. Your final images are professionally edited, retouched, artistically enhanced, and delivered to you via digital download one week after you make your selections from your online gallery. Complimentary prints are included in every session and delivered directly to your door to ensure you have beautiful artistic memories to display in your home. I know how important these first memories are for you and your growing family and that welcoming a new baby to the family comes with a lot of unexpected costs. Payment plans are available for sessions and packages. There are no fees, no interest, and the payment plan is structured to meet your needs. 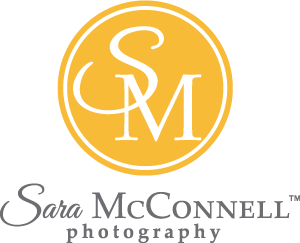 To see my most recent sessions, visit the Sara McConnell Photography Blog. The Extraordinary experience is for families who would like both posed and candid family photographs as well as photos of their baby or toddler on their own. These sessions are a wonderful opportunity for snuggles with your little one, the chance to read stories, and for toddlers 12 months and up, the chance to play in the bath or for a painting activity. Sessions take place on weekdays either in studio or outdoors when the weather is warmer. Sessions are 45 minutes in length. These sessions are perfect for capturing all of your baby or toddler’s major milestones and all of their unique features. Their little fingers and toes; lifting their head, smiling, sitting, and more can all be captured during one of these milestone sessions. Sessions take place on weekdays in studio. Sessions can include family and sibling photographs or can be styled to include just your little one. Sessions are 20 minutes in length. The Extraordinary and Memories Baby Sessions are both perfect for capturing your little one as they turn one, two, or three years old. During your baby’s birthday session we will create beautiful and timeless photographs of your child that not only you will treasure, but that your child and your children’s children will also love to have. My birthday sessions are styled around my timeless collection of studio sets, child size props, and classic accessories and clothing. When planning your little one’s session we will ensure the focus remains on your baby and their budding personality to hold onto this time forever and celebrate who your baby is becoming. Three sessions during your baby’s first year to celebrate their changing personality and milestones. Sessions are for babies, siblings, and their families. 4 Month Memories Session (20 Minutes) in studio on a weekday. 8 Month Memories Session (20 Minutes) in studio on a weekday. The package fee ($1189) includes all three sessions and a savings of $100. Payment for each session can be made separately. Custom Baby Photography Session Packages are available. We are happy to design a custom package to meet your needs. A timeless white set, your favourite flowers, and peaceful moments with your little one. These unique sessions are perfect for clients who want beautiful artistic images to hang on the walls of their home. Sessions are for bottle feeding and breastfeeding mamas who would like beautiful and intimate photographs of themselves with their babies in the milk bath. Sessions are 15 minutes and take place on weekdays in studio. Sessions are also for families who would like unique and whimsical photographs of their babies or toddlers (9 months to 2 years) in the milk bath. Babies must be sitting independently. The session fee ($345) includes 5 edited, retouched, and artistically enhanced digital files of your choice in colour and 3 complimentary gift prints of your choice or one 11x14 wall art print. If you enjoy creative, playful backdrops and would like to come into the studio for easy, yet adorable photographs of your baby, a Baby’s Extraordinary First Year Session is the right session for you. Each month on a set day, I offer 10-minute Moment Sessions with a unique and whimsical backdrop. These sessions are a wonderful way to mark the passing seasons and holidays and celebrate other fun childhood adventures (such as bathtime). For parents who would prefer timeless images, I also offer a neutral backdrop at the same time as my themed sessions. ONE Session, $149: includes 2 edited, retouched & artistically enhanced digital files of your choice and 1 complimentary gift print. THREE Sessions, $422: (Save $25), includes 2 edited, retouched & artistically enhanced digital files of your choice (per session) and 1 complimentary gift print. You also get priority booking for all sessions. FOUR Sessions, $556: (Save $40), includes 2 edited, retouched & artistically enhanced digital files of your choice (per session) and 1 complimentary gift print. You also get priority booking for all sessions. SIX Sessions, $834: (Save $60), includes 3 edited, retouched & artistically enhanced digital files of your choice (per session) and 1 complimentary gift print. You also get priority booking for all sessions. TWELVE Sessions, $1639: (Save $149), includes 3 edited, retouched & artistically enhanced digital files of your choice (per session) and 1 complimentary gift print. You also get priority booking for all sessions. Do you have more questions? Ready to book your session? We're happy to answer any questions and we're excited to work with you! For more information or to book your session, contact us directly. My Baby’s Extraordinary First Year clients tell me how much they love the variety, the ease of booking their session and reminders about upcoming sessions, and how fast and fun the sessions are for their little ones. "As a first time mom, I knew that I wanted photograph my little man in his first year so that I could be able to document all the little changes that would eventually fade over time in my memories. I did the newborn session with Sara and I was so happy with how the images turned out, that I was completely hooked on getting more professional photos done. I was so excited when I saw that Sara was offering the Baby's Extraordinary First Year packages, that I signed up for 6 sessions. I thought that it would give me a chance to do a session every two months, but of course that plan was blown out of the water when I saw the sets. Sara put together some of the most amazing sets that I often found myself in her studio every month because I knew that with the fantastic sets and her amazing talent, she would capture the most adorable images. As much as I had my camera out photographing my little guy in that first year, my favourite images are still the ones from the Extraordinary First year package because they were more exceptional than anything I could have captured at home."